Building a Future – Comprehensive Development, Inc.
Noah’s first project at SUNY Delhi was framing a house. Noah Sorensen, class of 2018 at City-As-School, is now in his second semester at SUNY Delhi majoring in Residential Construction. In the Delhi program his time is split between the classroom and the job site where he’s learning how to build a house from the ground up. “I didn’t think college was for me, and my Mom and I didn’t think we could afford it. I was ready to try to hop right into the trades and start working,” Noah says. It was Tomiko Abreu, CDI’s Post-Secondary Coordinator at CAS who encouraged him to look into colleges that offered a technology program that would enhance his skills. She also introduced him to the A to Z Impact Foundation, which funds a wide array of initiatives that help underserved populations access and improve the systems they need to live healthier, more prosperous lives. “Supporting a student is an investment that goes beyond just covering a cost, it has the ability to ripple out and impact the student’s future and the lives of those around them,” says Michael Kaplan, Executive Director and Andrea Kaplan, Board Member of the Foundation. Noah is just one example of the ways CDI is working to help students expand their view of how college can help develop careers for the today’s workforce. “When we talk to students about expanded options for life after high school we’re not just talking about encouraging them to get a job, but helping them to develop an educational pathway that supports their individual needs,” says Michael Roberts, CDI’s Executive Director. In conversations similar to the ones Noah and Tomiko had, CDI College and Career Advisors work with students during their final year in high school to map out their career pathways, develop a plan and figure out the best ways to implement it. CDI advisors encourage students to explore the full range of options that colleges offer. We are proud of Noah and will keep you posted on his (and the house’s) progress! 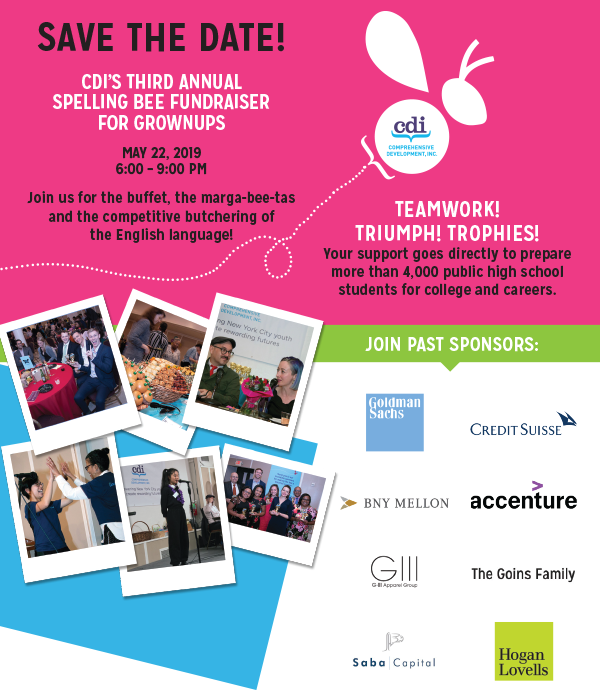 CDI’s Third Annual Spelling Bee for Grownups! Join us on May 22nd for a night of fun and spelling to support college and career preparation for more than 4,000 young people next year. We are abuzz in preparation! Students from our three schools are honing their spelling chops to represent their school at the Bee. The event team has been sampling the best Marga-BEE-ta recipes. And the Beemasters are readying their sneakiest words for both the students and the adults.